Rosangela was born at January 15, 1953, at Inhapim, a small city near the region known as “Steel Valley”, center of the state of Minas Gerais great ore refineries. At 1968 she moved to Brasília, the national capital, in order to conclude her fundamental education. Obtained the Brazilian equivalent of the high school degree at CIEM, a ephemeral experiment in fundamental education supported by the University of Brasília. Even being a book lover since childhood, only then she could make her acquaintance with the poetic work of Fernando Pessoa and Cecilia Meireles. Before graduating in Journalism, at the same University of Brasília, she worked as newswoman at “O Estadode São Paulo” local office, one of the most influent Brazilian newspapers. After her graduation she was accepted at the Program for Latin American Graduates, at the University of Navarra, in Pamplona, Spain. She later obtained her Master Degree at the Communication and Arts School at the University of São Paulo. She worked at several departments of the Brazilian Education Ministry, including the former Copyrights Council. She later served at Celso Furtado’s personal staff, during his term as Brazilian Culture Minister. At 1991 she moved to Salvador, the capital city of the state of Bahia. Approved at the qualification examinations, she became professor at both the Communications Faculty of Bahia Federal University and the Publishing School of Salvador Catholic University. At this last Institution she also graduated in Law. 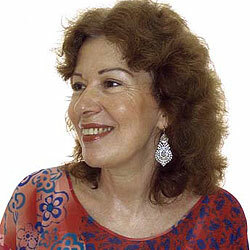 At the end of 1998 she returned to Brasília, where she now teaches Text Laboratory and Advanced Narrative Laboratory at the Communications Faculty of the University of Brasilia. She also coordinates the student’s experimental projects, mandatory for the receiving of their degrees. She is affiliated to both the Brazilian Lawyers Order and the Writers National Association. Her childhood at a small rural village was exceedingly important for her writings. After learning to write letters, she was charged with the work of writing love letters to the boyfriends of all her circle of teenage friends. She now considers this period the real beginning of her urge for writing, the turning point that forced her to seek the path towards literature. There weren’t bookstores or public libraries at her town, so the few circulating books soon became damaged objects, frequently lacking pages. One of her great traumas at that time was the impossibility of read the epilogue of Jane Austen’s “Pride and Prejudice”, a book she reveres. Years later, she bought several copies of that book, in order to exorcise her former feelings. Her first published work was “Moon’s Eve”, edited at 1990 after winning the first prize in the 1988 version of a national literary contest supported by Minas Gerais Federal University. Her first literary work, however, was “Stones’ River”, classified among the top ten at the Nestlé sponsored 4th. Biannual Prize of Brazilian Literature. This novel also received a Special Mention Award, conferred by the Brazilian Writers Union at the Graciliano Ramos Prize Contest and was finally published in 2002, after winning the first prize, at the Novel category, in a contest promoted by the Federal District Culture Office, “Brasilia Literary Production 2001”.